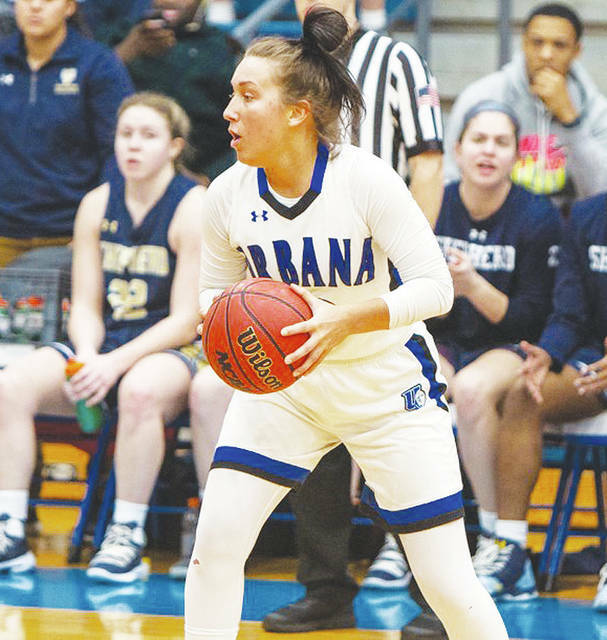 Senior Megan Beachy scored 21 points and passed 1,000 for her career as the Urbana University women’s basketball team rolled past visiting Shepherd, 82-51, on Saturday. UU improved to 3-17 overall and 3-13 in the MEC while SU slipped to 11-11 (8-8 MEC). The 31-point margin was the largest victory for the Blue Knights since defeating Wright State-Lake by 51 points on Feb. 20, 2017. It’s also the largest margin of victory ever against an MEC opponent. “We actually played great team ball not only on the offensive side, but as well on the defensive side,” said UU Coach Andrea McCloskey. “We played 40 minutes of unselfish basketball and it really showed in the box score with so many of our players contributing the entire game. I’m really proud of our team. Beachy led all scorers on 8-of-11 shooting to post her season-best performance and grabbed six rebounds. The senior became the 17th Blue Knight in program history to reach 1,000 career points. Senior forward Erin Morrow filled the box score with 12 points, seven rebounds, four assists and three blocks. Junior forward Sylvia Hudson added 11 points and secured a team-high eight boards with five steals. Overall, 11 different Blue Knights scored in the triumph. SU’s Sydney Clayton led the visitors with 14 points and eight rebounds while Kayla Tibbs chipped in with 11 points. UU executed on both ends, shooting a season-high 48.4 percent overall on a season-best 26 assists while limiting SU to the lowest field-goal percentage allowed at 32.8 percent. After trailing early, the Blue Knights closed the first quarter on a 14-2 run capped by a Morrow 3-pointer to lead 14-6. Another run in the second quarter gave UU a 17-point lead before the Blue Knights eventually went up 33-21 at halftime. Then, UU came out firing on all cylinders by outscoring SU 27-7 in the third. A suffocating 19-0 run by the Blue Knights, highlighted by back-to-back treys from Kami McEldowney, put the game out of reach. The UU lead swelled to as much as 36 early in the fourth quarter as a Beachy layup made it 66-30. The Blue Knights finished with a 47-36 edge on rebounds and forced 20 Shepherd turnovers. UU travels to West Virginia Wesleyan on Thursday for a 5:30 p.m. matchup.